Princess Zarith read Oriental Studies at Somerville from 1979 to 1983, and has stayed in touch ever since. She has led an extraordinary life since returning to her native Malaysia, where she is married to the Sultan of Johor, and leads efforts to improve the lives of ordinary people, especially women, in Malaysia. She publishes regularly in the Malaysian press and is Chancellor of The University of Technology Malaysia. Her fellow citizens know her as “the intellectual princess”. Princess Zarith is a Fellow of the School of Language Studies and Linguistics, Universiti Kebangsaan Malaysia (UKM). She regularly delivers the keynote address at the UKM International Language Conference. She is the Royal Patron of Oxford University Malaysia Club. Princess Zarith is a strong advocate of improving the use of English in Malaysia. In addition to Malay and English, she speaks Mandarin Chinese, Italian and French. She has authored several children’s books, including Puteri Gunung Ledang, and writes for the The Star’s “Mind Matters” column. 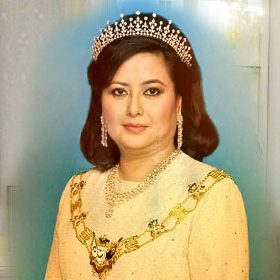 Princess Zarith supports various charitable and non-governmental organisations. She is a patron of the Johor Spastic Children’s Association, Rotary Club of Tebrau Heart Fund and the Malaysian English Language Teaching Association. She is also the Royal Adviser to the Malaysian Red Crescent Society. Princess Zarith came to speak to the annual meeting of the Somerville Association in 2012, and subsequently spoke at a round table conference on Islam and Science at the prestigious Ditchley Park Conference Centre. Her insight and concern for her own society, and her pragmatic, understanding and empathetic approach struck a chord with all her audience.